Ethel Smyth's opera The Wreckers premiered 110 years ago on 11 November 1906, in Leipzig. Smyth was 48 at the time, with a developing European reputation having trained in Leipzig, and The Wreckers was her third opera, written to a libretto by Henry Brewster. It is still a rarity in the opera house, having last been performed in London at the 1994 Proms (thankfully captured on disc), but the piece is an important way point in British operatic history coming forty years before Britten's Peter Grimes. Smyth was the only British operatic composer of the period to have a European reputation. The idea for the opera came to Smyth on a walking tour of Cornwall in the 1880s, and the libretto would ultimately be written by her friend (and sometime lover) Henry Brewster. Brewster is a somewhat forgotten figure nowadays, remembered mainly for his relationship to Smyth. An American brought up on France (Henry James is said to have based the character of Gilbert Osmond in Portrait of a Lady on him), he wrote prose in English and poetry in French. I have so far never managed to track down any of his published poetry, but would love to do so. He and Smyth met whilst he was married and their intense and complex relationship played out against the development of Smyth's musical career. By the time Brewster was free, she was reluctant to commit and he died in 1908, yet remained Smyth's most significant personal relationship. One of her last works would be the oratorio The Prison, based on Brewster's poetry. The plot of The Wreckers concerns a Cornish village in the 18th century, Led by the preacher, Pascoe, the villagers indulge in wrecking, luring ships onto the rocks to take the cargo. Pascoe's wife, Thirza, is in love with a young fisherman, Mark. Their plan to elope together is foiled when they are discovered to have lit the beacon warning the ships, and the villagers condemn them to be drowned, locked into a cave with the tide rising. I was lucky enough to catch the vividly dramatic production presented by Warwick University in 1983. Directed by Graham Vick, the production was imaginative (and economical). Performed by an amateur chorus and professional soloists (including Anne Mason as Thirza), the production took full advantage of the lively young chorus and I still remember the dramatic end to Act One when a net descended from the flies and the chorus members clambered up it and delivered the final chorus suspended in front of us; a musical and dramatic coup. The end of the opera was similarly effective, with the cave evoked by a surfaces covered in black plastic, the play of light on the shiny surface suggesting water. The opera was premiered in German (as Strandrecht) and commonly performed nowadays in English. But the work was written in French, not only was this Brewster's preferred poetic language but he and Smyth had their eye on a Covent Garden season with conductor André Messager and soprano Emma Calvé. But this never came about, and Smyth was forced to get English and German translations to facilitate performance. Neither is very high quality and for the work's centenary in 2006, Duchy Opera performed it with a new English version by Amanda Holden. The quality of the text was one of the complaints about the performance which Odaline de la Martinez conducted at the BBC Proms in 1994 (and which is thankfully available on disc, with Anne Marie Owens and Justin Lavender), with many critics apparently unaware that the English version, with its littering of opera-ese, was simply a poor translation. In fact Brewster's libretto was well constructed, and revised English translation should remedy these problems, though I would still like to hear it in French. The other complaints were that the work was no match of Benjamin Britten's Peter Grimes, and that the final scene did not match Wagner's Tristan und Isolde. 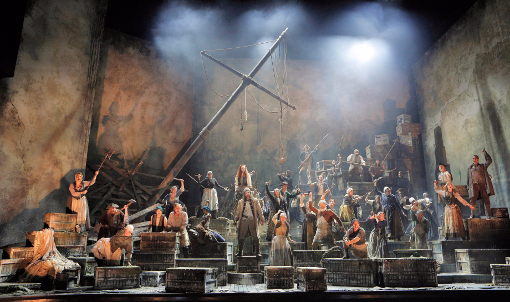 It is worth bearing in mind that the opera was premiered in 1906, 40 years before Peter Grimes, so it is surprising how much Smyth does get right. The prelude to Act Two (the overture On the Cliffs of Cornwall) and many other places do presage Peter Grimes. But there is no denying the work has its old-fashioned side. Smyth was trained in the Mendelssohn/Brahms axis, and didn't so much follow the Wagner/Strauss axis. But compared to the serious operas of Stanford and Sullivan, the work is a great leap forward. What performances like that at Warwick University showed me was that the piece works on stage on its own terms. Interest seems to be growing in Smyth's operas. The Wreckers received its US premiere last year at Bard Summerscape (see the review on Bachtrack). The Boatswain's Mate has recently made it to disc (on Retrospect Opera, conducted by Odaline de la Martinez, see my review), and there are plans for future operas though the state of Smyth's archive is problematic (see my interview with Odaline de la Martinez). London really needs to see a sympathetic professional staging of The Wreckersi; I am not sure that the prospects are good, but we can hope. For those interested in Henry Brewster, I suggest you try and get hold of Ethel Smyth's memoirs. The Impression that Remained includes her first meetings with him, and Female Pipings in Eden has a short yet valuable memoir of him. I hope to return to H.B. in a further article.